Today's my Friday (work-wise), so this will be the last column of the week. I know that puts a downer on your Friday, but try and mollify yourself with the knowledge that tomorrow I'll be in a cineplex somewhere enjoying the thrill-ride that I expect Quantum of Solace to be! Not helping? Sorry 'bout that. But you'll make it through somehow! Today it's time for this week's Poll results. There are a couple of interesting shifts to look at there. One I expected, the other? Not so much. Then I have my 2008 College Football Picks: Week 12. Hard to believe we're so close to the end. Like I said, I'm not a lock for a +.500 season yet, but we're getting close! So enough preambling, let's get to it! - Mark Twain (1835-1910), American humorist, satirist, lecturer and writer. Dan's corollary: "Until they prove otherwise, assume that the person in front of you is half a nut-job. You'll be right about 70% of the time." Not pretty, but I won't drop them on style points alone. The real proof will come in a couple of weeks. If they beat Oklahoma, they deserve to be #1 over Alabama. If Texas Tech loses to Oklahoma, do the Longhorns sneak into the Big 12 Championship and National Championship? Can you "sneak in" when you're this good? Can we find a 3-sided coin?! A new chant will find its way into the hearts of Gator fans: Stem the Tide! Their match-up with Texas Tech on the 22nd will tell if I'm right about voting them #1. I hate ranking them this high, but they are 3-0 vs. ranked teams. No other team in the country is ranked so high nationally based on perceived talent rather than actually showing up for all their games. Important win for the Utes over a solid TCU squad. Could we have 2 BCS busters this year? Dare we dream?! They keep getting the job done every week. Because somebody's got to be #10! I expected Penn State to take a tumble, but I was slightly surprised that Florida leap-frogged Oklahoma like that. Don't get me wrong, I voted it that way. I just didn't expect that many other pollsters to agree with me! Also, a pollster who will remain unnamed attempted to rank the Detroit Lions #10 because, "I think they might be able to squeak by Missouri". Nice try, but we can't accept NFL teams as part of the College Football Poll. Though technically, you may be correct. Next up it's time for the 2008 College Football Picks: Week 12! I had a good week last week, can I keep it going? Can I narrow that gap on the guaranteed +.500 season? Let's find out! 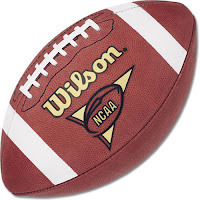 Nebraska -6.5 @ Kansas State (2:30pm): The Cornhuskers are 6-4 (3-3). The Wildcats are 4-6 (1-5). Oh, Husker fans? I'm baaaaaaaack! That's right, I'm reclaiming my title as your personal good-luck charm and am calling for a win this week! Nebraska's won 3 of their last 4 including a fairly impressive effort against Kansas last week. Plus, Bo broke out the Blackshirts this week. That's got to mean a win, right?! We're giving the 6.5 and calling for Nebraska to win 35-10! Wisconsin -14 vs. Minnesota (2:30pm): The Badgers are 5-5 (2-5). The Gophers are 7-3 (3-3). *This game is this week's Sports Take Flier Pick of the Week! I said it yesterday. -14 is way too big of a line in this game. I'm not saying that I could bring myself to bet Minnesota +14. But I don't like Wisconsin -14 one bit. So why the hell am I picking it then? Simple. This is my personal rivalry game. The Gophers still hold an honored position in the "Pantheon of Hate". The Badgers are my favorite college football team. Simply put, I can't not pick this game. So if I have to pick it, then I have to go with Wisconsin. So I'll reluctantly give the 14 and hope that Eric Decker really is that important to Minnesota's offense! LSU -18.5 vs. Troy (7pm): The Tigers are 6-3 (3-3). The Trojans are 6-3 (4-1). So LSU takes the #1 team in the country to overtime last week, and they're giving less than 20 points to a Sun Belt team at home this week?! This game was originally supposed to have be played on September 6th, but a pesky hurricane got in the way. I'm more confident in this pick than any other this week. So we give the 18.5 and hope nothing goofy happens to screw it up. UCLA -7 @ Washington (9:15pm): The Bruins are 3-6 (2-4). The Huskies are 0-9 (0-6). Washington's just bad. Bad, bad, bad. Their head coach is a dead man walking. Their team has been beleaguered by injuries all year. Their fan base is collectively wearing the paper bag over their faces. The Bruins aren't all that much better, but they're at least headed in the right direction. Seven points might be a touch high, but UCLA 30, Washington 14 wouldn't surprise me a bit either. So what the hey, let's give the 7 and check the score in the morning! All favorites this week. Hmmm, I wonder what that portends? Tune in Monday for the post-mortem to find out! That's going to be it for this week. Unless I find Quantum of Solace to be so good, that I can't wait til Monday to give you my review I guess. Until then (whenever that is), thanks for reading!